Whether you’re sending mobile text messaging alerts for sales events, coupons, discounts, notifications or announcements, our Mobile Text Messaging services will help make communicating with your clients efficient and easy. Allow your customers to engage in mobile text marketing with Text Me Promos, our innovative residual-based mobile marketing tool. We offer a number of promotional campaign tools through our one of our affordable and effective Mobile Text Messaging plans that are sure to drive customer engagement while providing effective and creative digital marketing messages designed to increase revenue. Unlimited Messages. * With our system, you can send out alerts when needed without worrying about how many you have sent for the month. *Some restrictions may apply. Unlimited Scheduled Messages. Have an upcoming promotion or a scheduled service visit? Schedule your message in advance so it reaches your customer at the right time. Easy Customer Sign-up. With our program, your customers can sign-up through your website, send a quick text message, or import your existing customer lists. Link Tracking. Want to see if text messaging works? Send a trackable link to your promotion and see which customers are seeing your promotions. Unlimited Groups. Sort your customers into special groups. Send custom messages to individual customers or to specific types of customers. Unlimited Message Templates. Have an on-going message you send every week or every month? Save your message as a template for easier use. Message Replies. When a customer replies to your text message, receive it on your phone in real time or view it through the dashboard. Easy Reporting. Easy and Clear reporting to show you how well text marketing works. 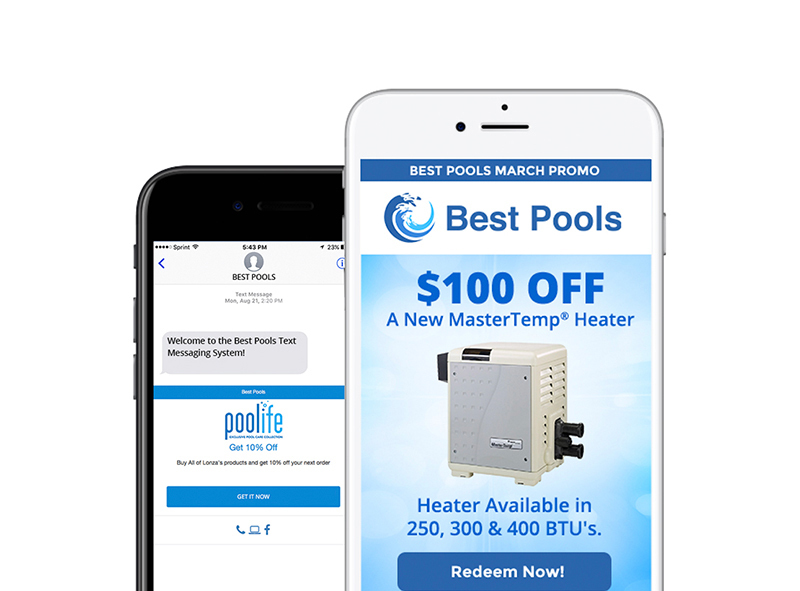 Our Mobile Text Messaging works best for pool retail companies wanting to reach out to customers directly to share current and upcoming promotions. Earn up to 14,199 Points.